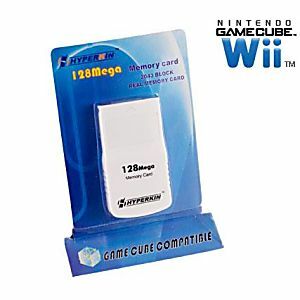 Brand new 128MB GameCube Memory Card. 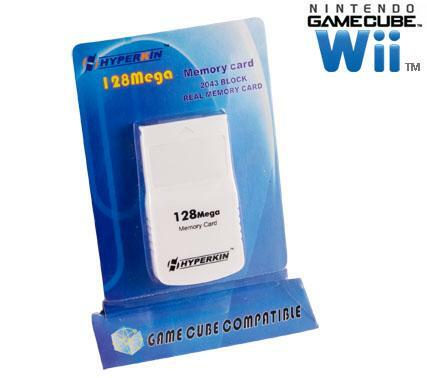 Equipped with 2035 blocks of memory, the GameCube 128 MB Memory Card can save or reload your GameCube game data. Don't play your GameCube games without it! The biggest memory card ever! Works great for the gamecube and the wii. Been playing ocarina of time and getting through it because of this. Inexpensive and shipped out quickly. The memory card works perfectly. Thank you Lukie Games. Plenty of space for the games I have. This is a good buy if your looking for more save space and don't want to delete old save files. The little boy I purchased this for is more than happy with it. Thanks Lukie for a great experience, and fast shipping as well. I've been looking for a memory card for my GameCube games. Not only was it on-time delivered, but I'm able to play my games and save my progress now. All around awesomeness! This was a perfect memory card for my Wii! My son loves the fact that he can play his GameCube games on the Wii and now has the memory card to make them work!! Thanks Lukie! The card works fine with GameCube as it said. Fair price and fast shipping as always with Lukie. They are the best source for outdated game system equipment that many of us still love to play. Awesome memory card, excellent condition! Will buy from Lukie games again! Loved this product have been using it for a month every day with no problems, good buy, reliable product! Fast service, great product, smooth transaction. Thanks!